Based on my experience teaching SketchUp, and my previous book “Woodworker’s Guide to SketchUp” this new work focuses on the common things new SketchUp users struggle with and provides detailed methods to understand what happens while working in SketchUp. When you have command of the basics, you can model anything. The enhanced PDF format makes this book easy to use as you learn 3D Modeling with SketchUp. You can find the information you need instantly because the entire book is “searchable” in Adobe Reader, and all entries in the table of contents are links to the pages they describe. There are also bookmarks for each chapter, chapter topic and video. The videos are within the pages so you don’t need to download them, fire up your media player or head to You Tube in the midst of learning, just click on the clearly marked videos and they begin to play. Last but not least are valuable references included with “Building Blocks of SketchUp”. There is a handy 2-page guide to Navigation (one of the common struggles), a one page Cheat Sheet for keyboard shortcuts (one of the best ways to speed up your modeling) and a 40-page guide to the Basic Tools of SketchUp, an ideal way to learn and review what each tool does (along with how and why it does it). Click Here to Read More About the SketchUp Tool Guide (and Download Sample Pages). 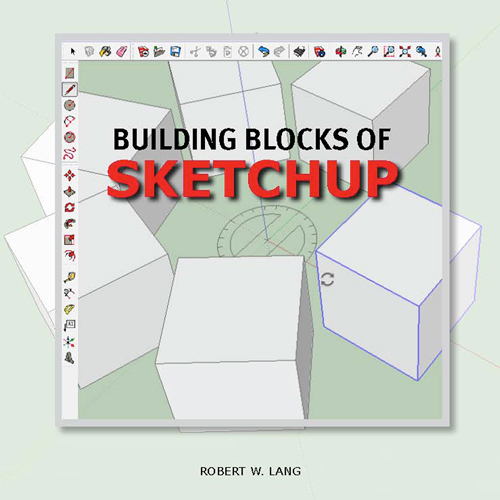 “Building Blocks of SketchUp” is independently produced and published. Your purchase directly supports the author and designer of this book. It is now available for $29.95 as a download in PDF Format. Please note: this enhanced PDF format requires that Adobe Reader be used to allow the video content to function. Adobe Reader is a free download and most PCs already have it installed. If you’re on a Mac, Preview will display the text and images, but the videos will not play. Adobe Reader is also available as a free download for Mac users. On the iPad, the video content will not function with either Preview or Reader. Other apps are available that allow video playback. Click here for info about the iPad. It is also available on disc, delivered to you by US First Class Mail for $34.95 with free shipping to US addresses. Shipping outside the US has become ridiculously expensive, my average cost for postage is now $11.65. I’m happy to fill out the customs forms and send a disc, but I have to recoup my international shipping costs. If you order the disc from outside the US, I’ll be in touch via e-mail to arrange payment. Download “Building Blocks of SketchUp” a 260 page book with 50 embedded videos in enhanced PDF format for $29.95 by clicking on the button above. You will need the latest version of Adobe Reader to make the most of the enhanced features of this book. “Building Blocks of SketchUp” is also available on disc, CLICK HERE for ordering details. Two questions: (1) will the new SketchUp book work well on a macintosh computer and (2) when I recently downloaded Sketchup I found the newest version is now version 13 not 7. So will all the material in your book apply equally to version 13? Thanks! “Building Blocks of SketchUp” is in Adobe PDF format and is equally compatible (as is SketchUp) on Macs and PCs If you read it on a Mac, the native PDF software “Preview” will let you read the text, but won’t play the videos. If you are on a Mac (or a PC) download the latest version of Adobe Reader to get the most from this book. “Building Blocks of SketchUp” covers the latest version of SketchUp 2013. SketchUp 7 was two releases ago, not 6 or 2006 as you might imagine. The new book covers features of the newer releases of SketchUp, but there haven’t been many changes. So if I download the latest version of Adobe Reader for MAC, I will be able to see the videos? I am not a beginner at Sketchup but Not an expert either. What is the difference between “Building Blocks of SketchUp” and ShopClass On Demand: SketchUp for Woodworkers – Part 1 and 2. If I bought all three would they overlap a lot? Any suggests would be appreciated. The “Shop Class on Demand” videos are just videos, there is no written text as there is in “Building Blocks of SketchUp.” I’m the author of both, so there are overlaps and similarities. If you can pick things up easily from just a video, you can be among the thousands who have learned how to use SketchUp with them. One of the down sides to the videos is that it can be tedious to find exactly what you’re looking for if you need to go back and refresh your memory. I think the combined video/text format is a better way to learn initially, and an easier to use reference down the road. I think if you master the basics with “Building Blocks of SketchUp” the woodworking-specific stuff will come easily. I would get the new “Building Blocks of SketchUp”. It’s more up to date with the software and I’ve come up with more efficient methods in the three years since “Woodworker’s Guide to SketchUp”. When you have the basics down, you’ll be able to model anything you want. “new” content is in the new book. I understand that you’ve updated your methods of presenting the information, and you’ve brought it up to date to reflect the new edition of sketchup, but I can’t get a read on “how much is new”, for lack of a better way to phrase it. First of all, if you learned how to use SketchUp from “Woodworker’s Guide to SketchUp” you probably don’t need the new book, go model your next project and get out to the shop. As the son of an engineer, it’s hard for me to put numbers on things like this. The biggest difference is that “Building Blocks of SketchUp” focuses on the basics, and that focus came from my live classes. It’s more thorough in those areas, and there is more information about materials, printing, online collections in the 3D warehouse and the differences between SketchUp 7 and the current version. If you’re adept with SketchUp 7 or 8, you’ll be able to get the changes to SketchUp 2013. A couple of years ago I switched from getting “woodworkery” right away in classes to playing with blocks for the first couple of days. That got everyone progressing faster than before and my theory with the new book is if you thoroughly understand the basics, you can take SketchUp in any direction you want. There are a lot of exercises we use in class that ensure people understand what is going on on screen. The “new” stuff is streamlined and more efficient ways I’ve found over the last three years. I’m aiming for a wider audience with this book, and I’ll invite those who have read both to chime in with their comments. I’m too close to be a reliable judge. Bob: thanks very much for the detailed response. I think I’ll buy it no matter what. being able to tell people after taking a 3 hour seminar with me (sketchup at 50,000 feet? 🙂 ) “go buy this book, I read it and its great” is worth it to me. Thanks for the kind words Scott. “Building Blocks of SketchUp” is intended to give the basics to anyone and enable them to move forward no matter what their end use might be. It makes sense to follow it with more advanced steps in specialized areas, such as timber framing, remodeling, furniture & cabinets and a bunch of other things. I have some irons in the fire, but nothing concrete at this point. Too many projects and too little time. Bob. Quick question. Some links on your store page end up with a paypal shopping cart. (some of the patterns) Some links end up with a “payloadz” shopping cart . (like the building blocks of sketchup) Is that expected? All of our online sales go through PayPal to handle the credit card transaction. I’ve used PayPal since 2001 and so far no issues. PayLoadz handles the downloads for the digital books (they are also available on disc). No problems with them either. Trying to by “Building Blocks” at special price because I’ve already purchased “Woodworker’s Guide”. Everything is fine until I’m switched to PayPal. At that point PayPal is adding $5.30 for shipping for a total of $25.25. All I want is the download. Help please.